The last fifteen years have seen a proliferation of peace agreements in diverse conflicts. 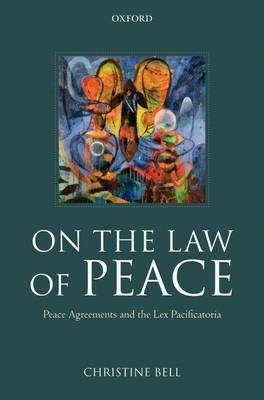 This book analyses how and why peace agreements are produced, focusing on the extent to which they are regulated by law, or impose legally binding obligations. The book questions what it is... read full description below. This book aims to provide a comprehensive analysis of the use of peace agreements from a legal perspective. The book describes and evaluates the development of contemporary peace agreement practice, and the documents which emerge. It sets out what is in essence an anatomy of peace agreement practice, and locates this practice with reference to the role of law. The author argues that a lex pacificatoria or law of the peacemakers is developing which is both significantly reshaping international law, and producing new forms of constitutionalism at the domestic level. The last fifteen years have seen a proliferation of peace agreements. These peace agreements have been produced as a result of complex peace processes involving multi-party negotiations between the main protagonists of conflict, often with the involvement of international actors. They document attempts to end conflict, and this book argues that they play an underestimated role in a political process that centrally revolves around law. Understanding peace agreements is important to understanding contemporary peace processes.Law plays two key roles with respect to peace agreements: first, to the extent that peace agreements themselves form legal documents, law plays a role in the 'enforcement' or implementation of the peace agreement; second, international law has a relationship to peace agreement negotiation and content, in an enabling or regulatory capacity. The aim of the book is to evaluate the role which law plays both in enforcing peace agreements and through a normative framework which constrains the ways in which they operate. This evaluation reveals a deeper link between the legal status of peace agreements and their normative regulation as mutually shaping, in what is argued to be a developing lex pacificatoria - or law of the peace makers. This lex pacificatoria stands as an account of the way in which international law shapes and is shaped by peace agreements, in ways which impact on contemporary debates about the force of international law. Winner of WINNER OF THE HART SOCIO-LEGAL BOOK PRIZE 2009. Christine Bell was born and brought up in Belfast. She is currently Director of the Transitional Justice Institute, and Professor of Public International Law at University of Ulster (based at Magee Campus). She read law at Selwyn College, Cambridge, (1988) and gained an L.L.M. from Law at Harvard Law School (1990), supported by a Harkness Fellowship. She subsequently qualified as an Attorney-at-law in New York, practicing for a period at Debevoise & Plimpton, NY. From 1997-9 she was Director of the Centre for International and Comparative Human Rights Law, Queen's University of Belfast. She has been active in non-governmental organisations, and was chairperson of Belfast-based Human Rights organisation, the Committee on the Administration of Justice from 1995-7, and a founder member of the Northern Ireland Human Rights Commission established under the terms of the Belfast Agreement. She has authored the book Peace Agreements and Human Rights (Oxford University Press 2000).